Live Earth. Support the Movement. 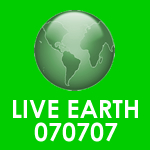 Support Live Earth. Support the movement in awareness of the climate in crisis. Download the icon below and use it as your msn picture on the 7 July 2007. Or Earlier. Or in fact, the month of July. Spread this message to everyone you know. Just finished watching 4:30 by Royston Tan. Bought the DVD this afternoon. Did not manage to watch it when it was on the big screen. Apparently, I could not find anyone that can appreciate this movie together, and in the end, did not went to watch the move. All I can say, I regretted not watching it when it was on screen. It was a damn great movie. It does not have the CGI SFX you see in blockbusters, nor the million dollars budget that entire you to get wow over. However, what it sells is the simplicity in the story telling. IT IS TELLING A STORY. And that’s very rare in movies nowadays. You have to watch the movie to know, and get in touch with the characters in the show. Yes, you will not regret it.